Wolfberry Post! : Lynden Energy Corp.
By our analysis based on the recent news release and articles by Canaccord Genuity and Keith Schaefer, Lynden Energy is significantly undervalued. The $0.50 current share price values the company at a $50 million market cap. The stock price should be trading much higher given the facts. Here’s another way to look at Lynden’s assets: Canaccord Genuity’s Daily Letter assumes an average recovery of 190,000 barrels per well and 180 net drilling locations. This correlates well with 40 acre spacing and 6,000 net acres (150 net well locations). This equals 30 million barrels of oil ultimately recoverable. Using an industry standard potential transaction metric of $17/barrel if this oil were proven, Lynden’s Wolfberry could be worth over $500 million. If these are just probable/possible reserves, then they could be valued at $5/barrel. Even at $5/barrel, LVL’s 30 million barrels of oil are worth $150 million. The Daily Letter further states that Lynden expects their Harrell 34 #1 well to ultimately recover 408,000 barrels of oil due to drilling down to the Mississippian limestone and production from the Atoka interval. Lynden and CrownQuest have shown to be innovative in their drilling approach by deepening their wells and are achieving some of the best results in the industry. Lynden’s association with CrownQuest gives them vast experience in the Wolfberry as CrownQuest has successfully drilled over 180 Wolfberry wells to date. Recent Wolfberry land transactions have been reported to be anywhere from $20,000/acre to $40,000/acre. With $20,000/acre and 6,000 net acres, their land could be worth $120 million. This valuation provides another metric that validates Lynden’s potential. Lynden’s Wolfberry land is in areas that are surrounded by proven Wolfberry wells. 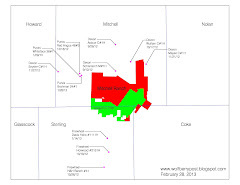 It appears that with the success they’ve had with their Wolfberry wells, their Wolfberry land is relatively low risk. This is evidenced by the Cawley reserve report released last year which stated that Lynden had 8.25 million barrels of proved plus probable reserves and this report covered only a portion of their Wolfberry lands. Given the recent release of initial results from their Mitchell Ranch Spade 17 #1 well, there is now some valid evidence that this area could have productive Wolfcamp wells. With over 50,000 net acres in that area, even a valuation as low as $2,000/acre (the recent March University Land Sale netted an average of $2,400/acre demonstrating the confidence that Permian Basin oil and gas operators have in the basin) result in an additional value of $100 million for Lynden. With additional success at Mitchell Ranch, the stock price could be multiples of what it is currently trading at. Given Lynden’s existing production in the low risk Wolfberry and the potential for the Mitchell Ranch lands to add SIGNIFICANT value, Lynden has a lot of value that is not currently recognized by the market. This is a great story and it’s only a matter of time before the market takes notice.